Since 1992, Code Three Fire and Safety has provided high-quality, competitively priced fire extinguisher services throughout Fairfield, Suisun City, Vacaville, Napa, Concord, Antioch, Vallejo, Pinole, Rio Vista, and surrounding areas. Our services include fire extinguisher sales, maintenance, repair, inspection, certification, training/demonstration, and hydrostatic testing. Throughout the North Bay and East Bay region, we have more than 5,000 satisfied clients; many of whom have been with us for many years, which stands as a testament to the exceptional quality of our services. Our clients include military bases, large commercial properties, retail/shopping centers, offices, warehouses, manufacturing facilities, industrial complexes, municipalities, restaurants, medical facilities, property management companies, correctional facilities, refineries, apartment complexes, residential customers, and more. At Code Three Fire and Safety, we are a certified distributor for all of the leading fire extinguisher brands, including Amerex, Ansul, and Pyro-Chem. We have ABC multi-purpose, BC, Purple K, Plus 50C, K Class, Type D, Halon 1211, CO2, and water extinguishers that range in size from 1 pound to 150 pounds for home, commercial, industrial, and marine use. Customers are welcome to buy a few extinguishers directly from us at our shop in Suisun City, or they can schedule an on-site inspection and consultation with one of our experts if they're looking to develop and fulfill a fire extinguisher plan for a commercial building. Each of our fire extinguisher technicians has between 15 and 30 years of experience working with all types of fire protection systems and is familiar with the requirements detailed by the State Fire Marshal's Title 19 California Code of Regulations as well as local jurisdictions. Whether you are a new business moving into a warehouse for the first time or an old business that is moving to a new location, we can provide the guidance you need to ensure that you have sufficient on-site fire protection to become and stay compliant. We consider everything from determining the size and type of fire extinguishers needed to the height placement of each extinguisher to the travel distance between extinguishers, before preparing your recommended plan and estimate. In California, a portable fire extinguisher in any kind of a business environment must be maintained once a year. At Code Three Fire and Safety, we are proud to offer affordable and comprehensive fire extinguisher testing, inspection, and maintenance services in Fairfield, Suisun City, Vacaville, Napa, Concord, Antioch, Vallejo, Pinole, Rio Vista, and surrounding cities that are in accordance with California's State Fire Marshal requirements. We are fully certified to service all types and brands of wheeled and portable fire extinguishers and maintain an exceptionally qualified team of technicians. Our technicians each have 15 years of experience or more and have been managing their own set of accounts year after year. As a result, our technicians are extremely familiar with their sites and often know the locations of all fire extinguishers at each facility better than the on-site staff. They keep very accurate inspection records for our commercial clients and proactively notify them when they are due for re-inspection. For annual fire extinguisher inspections, we perform a thorough check of the extinguisher's condition, gauge, and weight, and then replace the tag and safety seal. We also handle additional inspection requirements as required. For example, for dry chemical extinguishers, we must tear down and replace all internal parts and chemicals every six years (commonly referred to as a six-year teardown), and perform hydrostatic testing on the tanks (required every 12 years for those kept stationary in a building and every five years if stored in a vehicle). All fire extinguisher inspections are charged at an affordable, all-inclusive rates, so you don't have to worry about surprise changes for replacing component parts or chemicals, when they are a standard part of maintenance. Additionally, any time that we are on site, our technician will be able to provide fire extinguisher training and demonstrations at no additional cost. Code Three Fire & Safety also serves the fire extinguisher needs of boat owners. We can help you determine how many fire extinguishers you need to keep on your boat to comply with state and federal fire codes and ensure that you are prepared for an onboard fire. We also provide annual inspections, testing, maintenance, and training services for marine fire extinguishers on boats docked along most of the San Joaquin River Delta, including San Pablo Bay, Grizzly Bay, Honker Bay, Suisun Bay, and surrounding cities. Code Three Fire & Safety keeps a full supply of fire extinguisher replacement parts and related equipment, such as hoses, nozzles, brackets, and cabinets. If a fire extinguisher has been dropped or damaged, you can bring it to our attention, and we will do our best to repair it, saving you the cost of replacement. Common fire extinguisher repairs include replacing the nozzle, repairing the gauge, or re-installing a bracket. If a fire extinguisher has been discharged, it is always best to have it re-checked and recharged/re-pressurized by qualified personnel. We can provide our cost-effective, expert fire extinguisher repairs and recharge services anywhere in the Fairfield, Suisun City, Vacaville, Napa, Concord, Antioch, Vallejo, and surrounding city areas. Call Code Three Fire & Safety today to arrange for any of our fire extinguisher services. We are licensed by the Contractors State License Board as well as the State Fire Marshal. We belong to the National Fire Protection Association, California Fire Chief's Northern Division, and California State Firefighters' Association. We are dedicated to providing the best possible fire protection services in the North Bay and East Bay region and make it our mission to make these services at an affordable price to residents and business owners throughout Fairfield, Suisun City, Vacaville, Napa, Concord, Antioch, Vallejo, Pinole, Rio Vista, and surrounding cities. ABC - This is a multipurpose fire extinguisher that is approved for use at most businesses. BC - This is appropriate for charged electrical and grease fires only. Purple K - This is used for charged electrical fires and flammable liquids only. In most cases, Purple K has been replaced by ABC, but is still frequently used by refineries. Plus-Fifty C - This is an extinguisher that can be used for charged electrical fires and flammable liquids. K Class - This is used in commercial kitchen/cooking facilities only. It is considered the first line of defense in the event of a fire as it uses the same chemical components as commercial kitchen fire suppression systems. 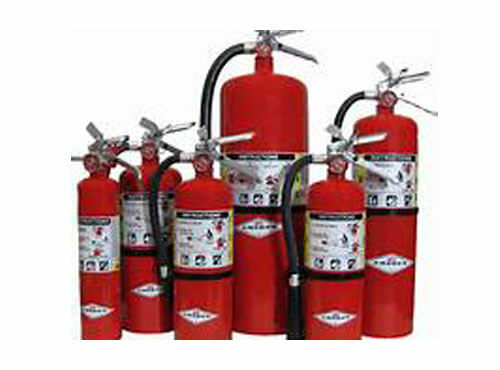 Class D - Class D extinguishers are used for metal fires, such as titanium, aluminum & others. A lot of auto body shops are required to install them because many of the newer cars are made of titanium and aluminum rather than steel. They are also required at airports. Halon 1211 - This is a highly efficient fire extinguisher that is ideal for computer rooms and sensitive electronic equipment. It features a liquified gas that puts fires out by removing the oxygen from the area. Unlike a dry chemical, it has no residual corrosive effects. CO2 - This is an older version of the Halon extinguisher. It is a BC-rated fire extinguisher that is designed for putting out fires near sensitive electrical equipment. It is often used by automotive shops because it doesn't cause a lot of residual damage. Water - Water extinguishers are used in landscaping and by CalTrans to put out small fires. They can only be used on standard combustible items, such as grass, cardboard, and paper. 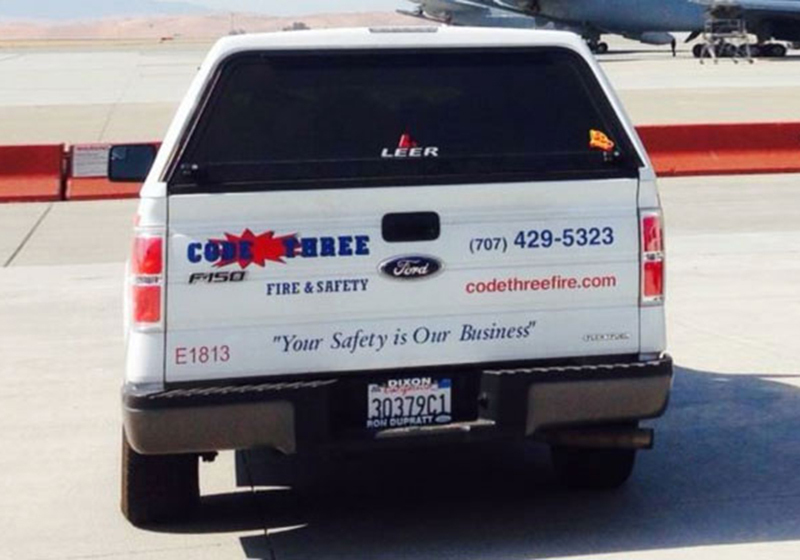 Code Three Fire and Safety has been Travis Air Force Base's fire protection contractor for over 15 years. We install, service, and repair the base's fire extinguishers for all of its aircrafts and buildings. We're proud to provide fire protection equipment that provide base and our service men and women safe from fire hazards. 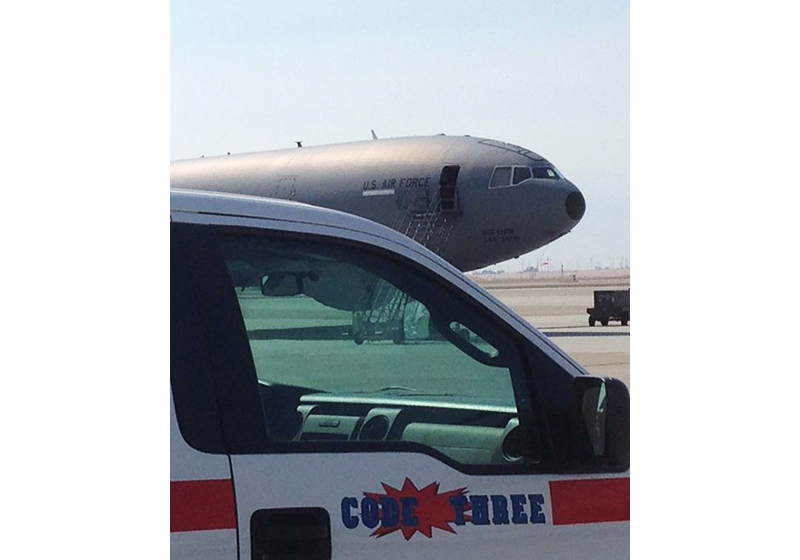 We're proud to be the go-to source for fire protection services for Travis Air Force Base in Fairfield, CA. The base has several fire extinguishers on board and static extinguishers on their flightline, all of which are inspected and maintained by Code Three Fire and Safety.